Dr. Usa Klinhom is one of the chief scientists conducting research on the Phellinus mushroom. She heads our research team in the Biology Department, Faculty of Science, Mahasarakham University, Thailand. 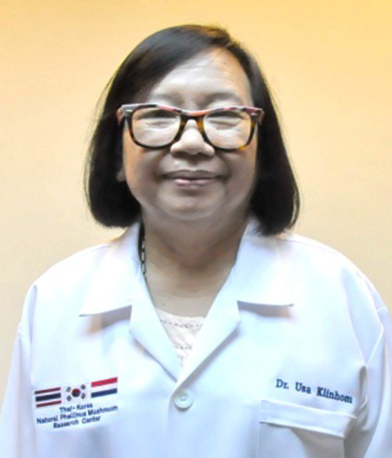 Dr. Usa Klinhom received her Ph.D. in Biology at Mahidol University, Thailand in 1989. Trained in Thailand, Malaysia, USA, Australia, and New Zealand, Dr. Klinhom’s research interests included Ecology, Ethnobiology, Ethnoecology, Wetland Ecology and Forest Ecology. Dr. Klinhom is renowned for her research in the field of traditional medicine. She is currently a sub-committee member on Traditional Medicine License as well as a sub-committee member on the Promotion and Development of Traditional Knowledge Usage and Traditional Medicine, Ministry of Public Health, Thailand. Her research at the Thai-Korea Natural Phellinus Mushroom Research Center focuses on the identification of Phellinus strains as well as the genetics and DNA of Phellinus mushrooms. Dr. Klinhom has published numerous articles and research publications, and has also published two books. 1973 BS Agriculture, Khon Kaen University, Thailand. 1976 MS Biology, Chulalongkorn University, Thailand. 1989 Ph.D. Biology, Mahidol University, Thailand.